The 6.8 Magnitude Earthquake that shakes the entire land of Northern Chile. According to U.S Geological Survey, the original record is at 6.7 but later change it higher. It started at 4:15 p.m. (3:15 p.m.; 2015 GMT). 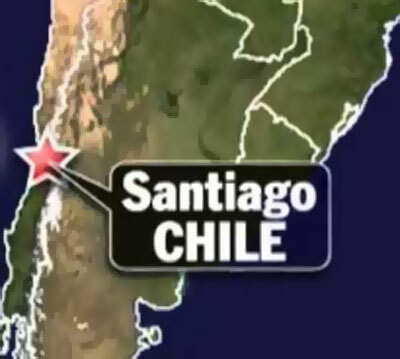 Mayor Rafael Prohens said, "55-year-old woman in city of Atacama died of a heart attack." Authorities assumed her death due to fear during the earthquake. The earthquake shakes the capital of Santiago, all buildings move to sway, but was felt most powerfully in the north part areas where state television showed photos of scattered groceries at supermarket floors and broken windows of homes and other nearby cities. According to Chile's Emergency Office, ONEMI, there's no injuries were immediately reported and minimum damage to infrastructure. ONEMI national chief Miguel Ortiz said, "There's no doubt the population in some places fled, following a culture of evacuation." The country of Chile is one of the most earthquake-prone in the world. And The strongest earthquake ever recorded is a magnitude-9.5 in 1960. Comments or suggestions about "6.8 Magnitude Earthquake hit Northern Chile" is important to us, you may share it by using the comment box below.